Wintry conditions led to low visibility at a number of European airports on Tuesday, causing flight delays for many passengers. 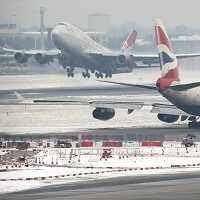 Heathrow, Gatwick, London City and Brussels all experienced problems, with the adverse weather carrying the potential for further disruption over the next few days. After cancelling more than 200 flights on Monday, Heathrow advised passengers to check with their airlines before travelling on Tuesday. There is nothing worse than having a flight cancelled, but luckily people can cover themselves against such scenarios through various travel insurance policies. The weather was causing some disruption to flight schedules at Leeds/Bradford Airport, while Manchester called in dedicated teams to clear snow from its runways. Newcastle is also bracing itself for more snow in the coming days. Meanwhile, airports across northern and central Europe including Lyon, Toulouse, Milan (Malpensa and Linate), Munich, Berlin Schoenefeld, Innsbruck, Krakow, Geneva, Basel and Zurich could also experience disruption.